HomeFrontpageNewsUnder 15 squad go barefoot! Under 15 squad go barefoot! 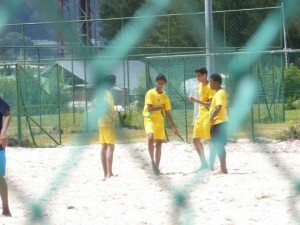 In the absence of Seychelles Football Federations’ schools fixtures at this time of the year the ISS under 15 squad participated in the inaugural Beach football tournament at the newly constructed pitch at the Stade Linite complex. F.I.F.A. officials including Suketu Patel of F.I.F.A. Africa were present among the spectators as 4 local school squads and 2 teams from ISS enjoyed the competition and the new challenge of deep sand 5 ‘a’ side. It was fast, furious, fun football in sweltering conditions with a Lucas hat trick for ISS in our final game being the highlight. We’ll be back for more experience of the beach version of the beautiful game soon.